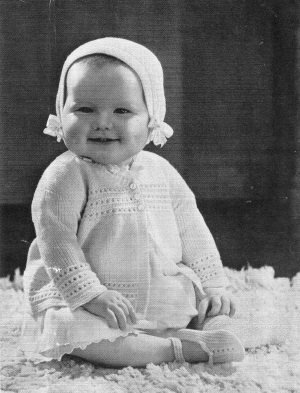 Vintage baby sweater, bonnet, cap, slippers and mittens[/caption]Here’s a complete outfit, perfect for a baby-to-be. The simple eyelet design is quick to knit and there is a choice of hat to accompany the sweater and mittens. Slippers to finish it off. Notes to help translate this vintage pattern’s materials into modern terms are included on the back page.